For over twenty years Rhett Miller and his Old 97's have been delivering great alternative country with lyrics that involve tongues being firmly planted in cheeks. Now their back with a collection of new tunes, Most Messed Up. Old 97's have inspired many an artist during their run. It's easy to hear the germination of Bright Eyes, for example, in the jangly off-kilter opener "Longer Than You've Been Alive". The more straight ahead fast-paced "Give It Time" could come from any number of current alternative country acts. The overarching theme of the record is boozing and living it up...and sometimes the consequences of doing just that. The most obvious are the ode to whiskey "This Is the Ballad", and the snotty singalong "Let's Get Drunk & Get It On". A south-of-the-border theme and sound on "Guadalajara" gives it the feel of any one of David Lowry's projects. That goes hand-in-hand with the gritty, sun burnt "Intervention". The catchiest tracks come in the form of the toe-tapping liquor-soaked "Wasted", and the hook-heavy "The Ex of All You See". 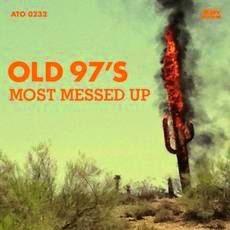 Most Messed Up is a fun album that will keep yielding lyrical nuggets with every repeated listen. A solid choice for your summer parties. Best tracks: "Wasted", "The Ex of All You See"